This craft takes a little time for the paint to dry so it might be a better choice for camp or an activity day. Eggs – either blown eggs or cardboard craft eggs. paint and paint brushes – metallic are a good choice. For monster eggs you might want glow in the dark paint. Prepare the eggs by putting a blob of hot glue in the larger hole of the blown egg and sticking the tooth pick in. The tooth pick now acts as a handle while you paint your egg. Paint a base coat of pain on your eggs. We found it took at least two coats to get a good base down. 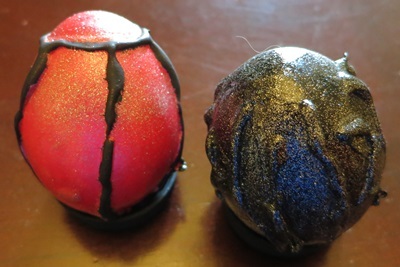 If you want, you can spray some metallic paint (we used silver sparkles) over your eggs. Cut off the toothpick and place in a holder. We painted Gateraid lids to act as holders. Note: To make this craft easier for younger girls you can used coloured or sparkly hot glue and add the glue veins at the end. This craft is inspired by this project from Instructables.